The Killers. Human? Dancer? Whatever! Going head-to-head with Guns N' Roses' Chinese Democracy in Europe, The Killers release their third album Day & Age on Monday 24 November. One fateful morning in 2002, a minimalist entry nestled amongst the lonely hearts and unwanted patio furniture in the classified section of the Las Vegas Weekly. Guitarist Dave Keuning was clearly paying by the word. 'Looking to start or join band?' asked his ad. 'Influences: U2, Pumpkins, Oasis'. 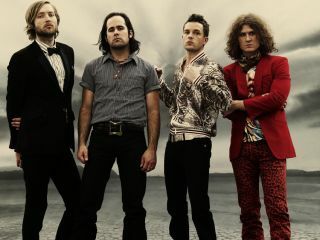 The odds of Keuning recruiting a Mormon with a moustache fixation were slim, but vocalist Brandon Flowers was reportedly the most normal applicant by some distance. "All the others were very strange," recalls Keuning. "I got one guy who had tattoos on his arms listing the dead people he had in his family." With all the best band names taken by the late-'70s, it seemed inconceivable that 'The Killers' had slipped through the net. In fact, it hadn't: this was the name of the fictional band in New Order's 2001 Crystal video. "The video had this band who looked all hot, pretending to be New Order, but known as The Killers," recalls bassist Mark Stoermer. "We saw that name on the kick drum head and lifted it." Watch New Order's video for Crystal featuring fake band The Killers below. No, really. This unfortunate early draft appears on the bass drum in the Mr Brightside video. The baffling 'I've got soul, but I'm not a soldier' chant from All These Things That I've Done has so far been hijacked by three rock behemoths, with U2, Coldplay and Robbie Williams all dropping the line at concerts like it actually means something. On Day & Age, meanwhile, Flowers has upped the ante with Human's frankly nonsensical "are we human or are we dancer?'" In the mid-'70s, Fender squared up to Gibson with their own spin on the semi-hollow ES-335. Widely unloved, the Starcaster had ceased production by the '80s, but lives on in the hands of spring-haired guitarist Dave Keuning. "Not many people use them," he admits. "A friend in Vegas had one. I played it and it sounded great. I had to have it shipped in from Japan. I love it - I used it a lot on Sam's Town." Radiohead's Jonny Greenwood is another Starcaster fan. Watch Keuning use it in the Human video. Keuning's backline for Day & Age was a combination of Fender Hot Rod Devilles and a David Gilmour Hi-Watt. "Six weeks into Sam's Town I bought these Hi-Watts - the David Gilmour 100-watt signature series head and a Hi-Watt cab - and I used them on the rest of the record," he explains. "Some Fenders sound great, but they're a little more thin. This had a wider frequency, or that's what it felt like to me." Having 'done' British indie on Hot Fuss, the Americana themes of The Killers' second were hammered home by a title referencing the Sam's Town Hotel And Gambling Hall in Las Vegas (despite the strict anti-fluttering stipulations of Brandon's Mormon faith). Finally - an explanation for the waistcoats, the obsequious grin and the tendency to snap to attention when a bell rings (well, maybe not the last one). He recalls: "We used to get pimps going to the hotels. They'd promise a good tip as you loaded the car, but never would. Pimps and gypsies - terrible tippers." "I don't like simple Ramones power chords," he says, "and folk music - it's just D, G and C. I don't like to play like that. I prefer chords that have more flavour." Meanwhile, his favourite solos are Everything Will Be Alright from Hot Fuss, Read My Mind from Sam's Town and Losing Touch from Day & Age. Well, mostly. But he does play a mean Fender Jazz on For Reasons Unknown. Has anyone else got even better Killers facts?